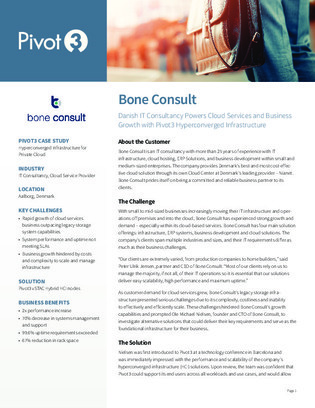 As customer demand for cloud services grew for cloud services provider Bone Consult, their legacy storage infrastructure presented serious challenges due to its complexity, costliness, and inability to effectively and efficiently scale. Resulting in system performance issues and an inability to meet SLAs, these issues greatly hindered Bone Consult’s growth. To achieve the necessary levels of mixed-workload performance, scalability, and availability, Bone Consult began researching hyperconverged infrastructure (HCI) solutions. View this study to learn why they selected Pivot3 to help them resolve their costly infrastructure issues.